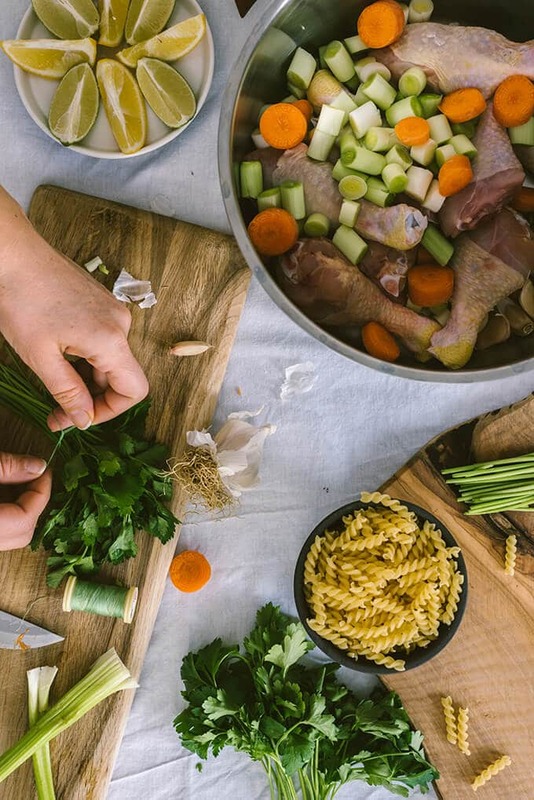 Learn how to make Chicken Noodle Soup From Scratch and feed your soul all winter! It is full of flavors, super hearty, healthy and easy to make. Made with chicken, winter vegetables and noodles, this soup is super filling too. You can serve it as a weeknight meal on its own. I’m not a winter person because I don’t like the feeling of cold and the thick clothes we have to wear. Winter is tolerable for me just with the comforting soups. The feeling of getting warm with a hearty soup is great! The only thing I crave for, when it’s freezing cold outside, is a comforting soup. I don’t need anything else for dinner if we have a delicious and satisfying soup like this. It’s become our ultimate winter soup since the first time I made this chicken noodle soup from scratch. Obviously, it was beyond expectations! Everyone begged for the second. Loaded with wonderful vegetables, this soup is one of the best immune booster recipes too. My family’s all time favorite soup is Tomato Chicken Orzo Soup and I make it quite often in winter. Oh yes even in summer for my son. It is the easiest soup ever if you have leftover chicken and chicken stock. 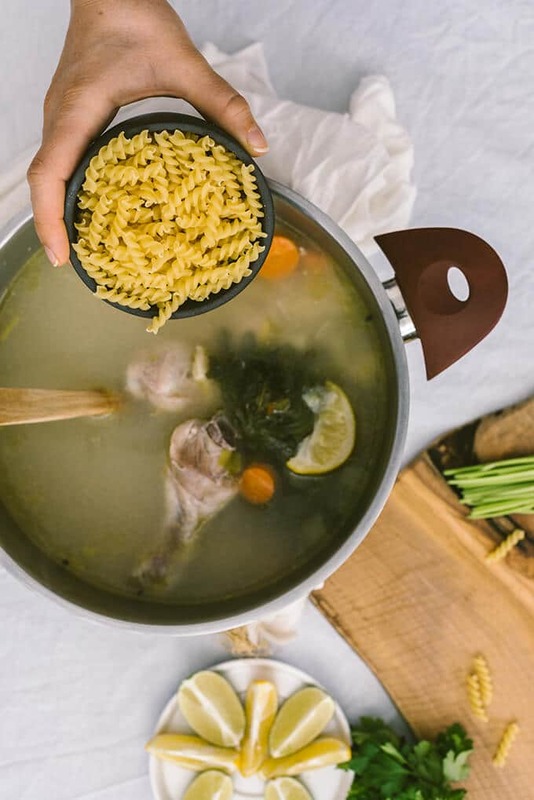 To make a soup that is a meal on its own though, I add some vegetables and noodle in it and end up with this easy homemade chicken noodle soup. This is a chicken noodle soup recipe with carrots, leeks, celery, garlic and ginger. 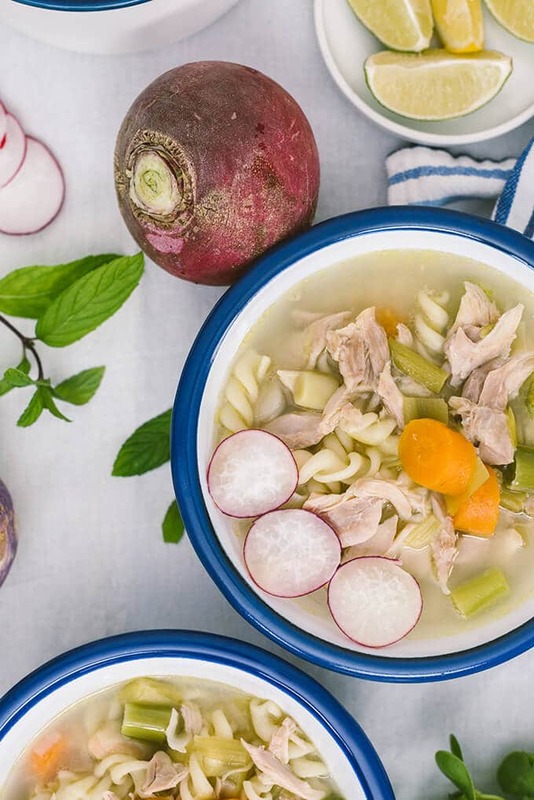 To get even more winter flavors, garnish your chicken vegetable noodle soup with slices of radish and turnips. Super flavorful, super yummy and super healthy! First, cook carrots, celery and leeks with butter in a large pot for a few minutes. Add in water and cook, stirring occasionally for about 2 minutes. Second, put the chicken, water, garlic, ginger and lemon. Third, tie a small bunch of parsley and throw it into the pot. This will take the final flavor of the soup to next level. Cook until chicken is quite tender. Fourth, while the soup is simmering over low heat, remove the chicken with the bones from the pot. Add in some pasta and cook for 5-6 minutes. Meanwhile shred the chicken and remove the bones. Finally, add the shredded chicken back to the pot. Season with salt and black pepper. Give it a stir and simmer for a few minutes. It’s ready to serve. My number one important note about a good chicken soup is to make your own chicken stock. It takes more time, but it is definitely worth. The recipe below includes it. Use store-bought chicken stock only when you are very busy and have to make the soup quicker way. Adding pasta make the soup thicker, so be careful about the amount of it. One cup is enough in this soup. If it still thickens at the end, add in some hot water, stir and bring the soup to boil. When making chicken noodle soup from scratch, I use either a whole chicken or chicken drumsticks with the bones and skin on. The flavors of bones and the fat from the skin add richness to the soup, so please do the same if you are after a scrumptious soup. One must-have ingredient in this recipe is parsley. If there are little ones in your family who don’t want to see parsley leaves floating on their soup, here is the tip: Get a small bunch of parsley, tie a knot around it and throw it into the pot. The herb will give all its amazing flavor into the soup. You can remove it from the pot when the soup is ready. Is Chicken Noodle Soup Good For A Cold? Yes! This is a soup that doctors recommend to beat cold symptoms. Any chicken soup helps to sooth nasal congestion, but we can increase its health benefits with additional ingredients. All the vegetables in this recipe are good to fight a cold and they are perfect immune boosters. Is This A Gluten Free Chicken Noodle Soup? No, but you can easily make it gluten free. Substitute cornstarch for all purpose flour here. Instead of cooking it with the vegetables, whisk it with a little cold water and pour it in the pot with the rest of the water. In addition, use gluten free pasta. Did you make this Chicken Noodle Soup From Scratch? Please rate it below and leave your comment! Chicken soup that is full of flavors, super hearty, healthy and easy to make. It is packed with chicken, winter vegetables and noodles. Perfect comforting soup recipe to warm your soul! Heat a large pot and melt butter in it. Stir in the carrots, celery and leeks, cook for 3-4 minutes. Stir in the flour and cook for 2 minutes. Stir in the chicken, water, garlic, ginger and squeeze a lemon in it. Throw the lemon halves into the pot after squeezed and remove it when the soup is cooked. Tie a bunch of parsley and throw it into the pot.If you want, you can remove this after the soup is cooked. Cook until the chicken is tender and splitting from bones. Remove the chicken and shred. Meanwhile add in the pasta spirals when the broth is still simmering and cook for 5-6 minutes. Add in shredded chicken, salt and black pepper. Simmer for a few minutes and serve hot with radish slices on the top. Originally published in 2016 and updated with additional information in 2018. This was such a healing soup. Exactly what I needed. Thanks for sharing. Glad it helped you my friend!